Published in cooperation with the Radiological and Medical Physics Society of New York (RAMPS). Intended for residents in therapy radiology and radiation oncology to use as a practice exam or for self study. Each version of the exam, Diagnostic or Therapy, includes general questions incorporated into each, and approximately 140 questions in each booklet. 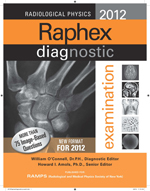 The 2012 Diagnostic Exam has been completely redesigned with 70 new image-based questions. It more closely matches the expected format of the new ABR Diagnostic Core Exam. This booklet will be a useful advance study guide or practice test for the new 2013 ABR Exam.